There’s something extra special about a good enduro bike — that rare breed of machine that lets you first ride to the trail, then ride up it, then ride home again. That go-anywhere freedom is at the heart of motorcycling, and few bikes can truly go anywhere (at least legally) like an enduro can. While the big daddy poster boy for the genre remains the BMW R1200GS, I prefer the smaller beasts. 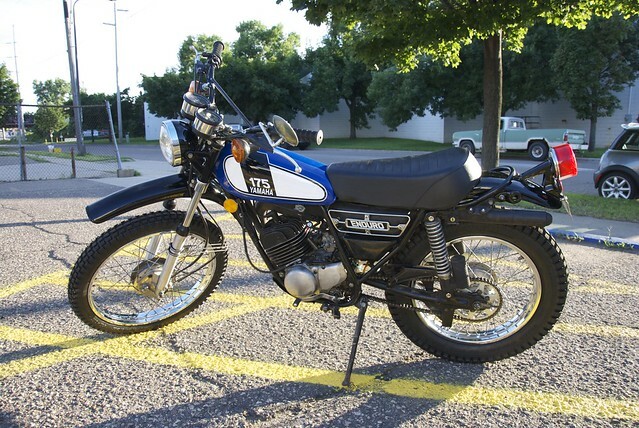 Take, for example, this fantastic vintage Yamaha 175 Enduro. We got this bike from a customer who not only wanted its engine troubles sorted out, but wanted the whole bike refreshed. The bike ran, but not well. Worn rings meant this little thumper had a bad case of piston slap — where the piston rocks from side to side while moving up and down, bouncing off and beating the hell out of the cylinder walls. 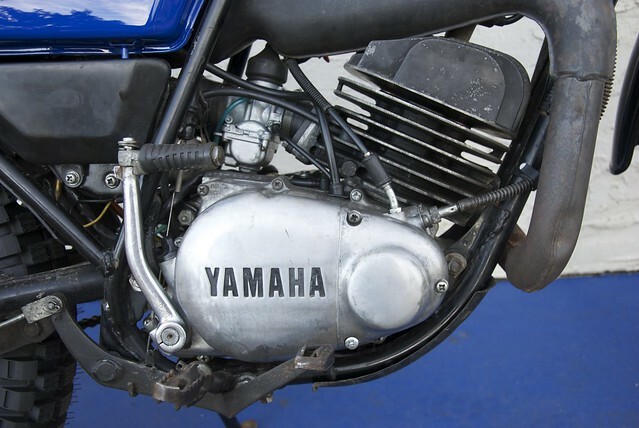 A top-end rebuild and a little TLC had that sorted out and the engine revving like new. With the internal engine work done, our attention turned to catching the bike up on maintenance and swapping wear items where needed. The 175 Enduro got a fresh chain and new sprockets. It’s always important to change these as a set, as they all three wear in and wear out together. The fork seals were blown out, so those got swapped as well. Then, a pliable new set of knobby tires wrapped the wheels — making the plucky little Yamaha road and trail-worthy once again. 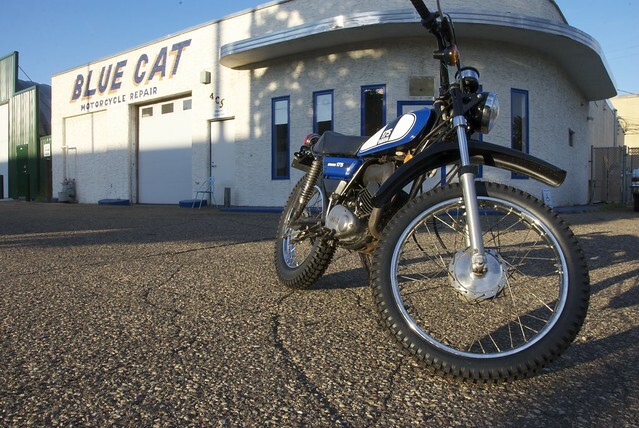 Much to our delight, however, the owner wanted this little 175 Enduro to look as good as it now ran and rode. We sent the tank, fenders, oil bag, and headlight bucket/ears to our favorite paint expert, Bob. 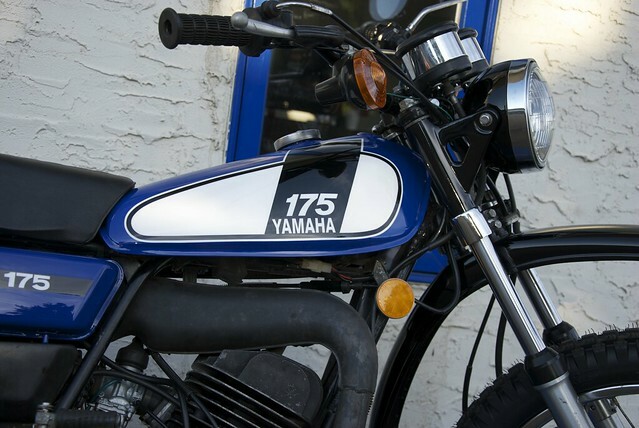 He managed to not only make everything look shiny and new, but he deftly integrated some reproduction Yamaha graphics we’d found. Sealing it all underneath the clear coat tied the whole thing together very nicely. With all the body work back on the bike, the result was stunning. A somewhat interesting little multi-purpose motorcycle had become an inviting little gem. This wasn’t a frame-up restoration, so there are still little bits of patina and wear here and there. That’s a good thing though. It’s not so pristine that you’d be afraid to get it dirty. On the contrary, it’s such a nice looking machine now that it just begs to be ridden. The best part is, now it can be ridden, and just about anywhere. Whether up the trail or down the road, we’re sure it’ll turn heads.